The home side went down by 14 points at the Gaelic Grounds in a disappointing opener to the league campaign. 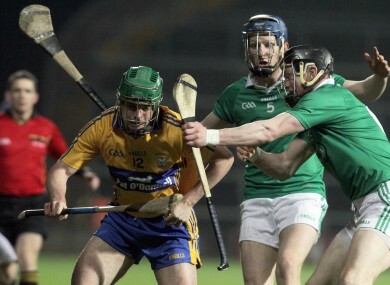 CLARE HIT THE ground running in Division 1b of the National Hurling League. The Banner men were overwhelming 1-13 to 2-24 winners away to Limerick. The difference between the sides at the end was 14 points and 13 of those belonged to Conor McGrath who ended the night with an impressive haul of 1- 10. Limerick came out of the blocks effectively enough and led by a goal after the opening quarter, thanks to the early strike from Niall Moran. McGrath’s expertise from frees ensured Davy Fitzgerald’s men were always in touch. Then, they took pride in showing their extra gear and an unanswered 1-5 helped them move clear by half time. 1-8 to 1-12, a score only narrowed by the consistent shooting of Limerick’s Shane Dowling. After the break, Clare kicked on again and this time, John Allen’s side were left for dust. McGrath and Sean Collins (pictured) tagged on points as the visitors stetched their lead. Conor Allis, eventually, stopping the rot. With under 15 minutes to go, McGrath hit the net, adding to the earlier three-pointer from his namesake, Colin. Fitzgerald’s men now were finally able to take their foot off the pedal and John Conlon tagged on the late score to round up the difference between the sides to 14. Allen will have plenty to work on with his charges before they go on the road to face Laois in two weeks time. Email “Hunger games: Clare comprehensive winners over Limerick”. Feedback on “Hunger games: Clare comprehensive winners over Limerick”.